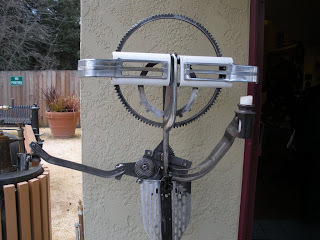 We visited wine country for a little rest and relaxation in early march. I've been meaning to blog about our trip for days but just haven't had the time until now. Apologies for the belated post! We set out on Friday morning by car. 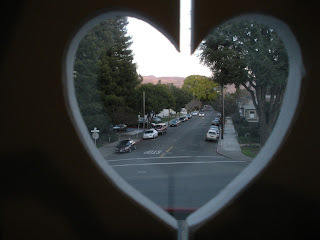 We crossed the Golden Gate Bridge and made our way up the winding roads to the Napa Valley. 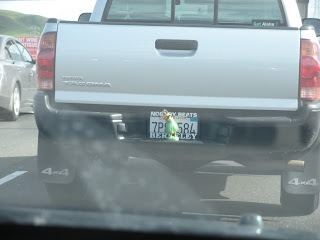 We were following this truck for a while -- I loved the hula girl riding on his licence plate! I just knew this carefree sighting portended great things for our wine weekend. We decided to go as far north as Calistoga and then work our way south to our Bed and Breakfast in Napa proper. We intended to start our wine tasting adventure at Chateau Montelena, the underdog American winery that upset the French juggernauts in the 70's and really put Napa on the map. 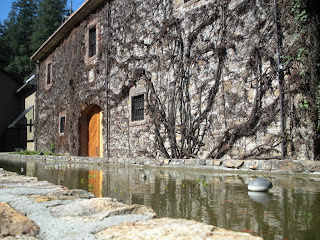 Chateau Montelena was featured in the movie Bottle Shock. We quickly learned that Chateau Montelena charges a steep price for tasting just four of their wines -- $20! We decided not to bother tasting here and to try some of the lesser known wineries in the neighborhood instead. 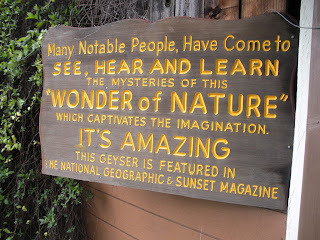 We recalled seeing a sign for a winery called Envy on our way to Chateau Montelena. We were intrigued by the name and decided to go there instead. I'm so glad we did. It was much more our style. The tasting fee was $5 and they were very generous with the pours. The tasting fee was also applied to our purchase -- we bought 4 bottles. 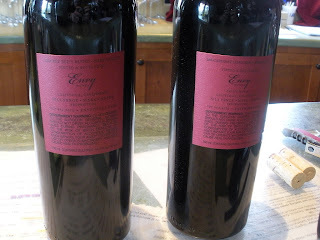 I definitely recommend Envy is you're looking for a down to earth, non-pretentous tasting experience. If you're a regular reader of my blog, I'm sure you realize that I have a place in my heart for kitsch of all sorts. Our next stop was the Old Faithful Geyser of California. Described as "Many Notable People, Have Come to See, Hear, and Learn The Mysteries of This 'Wonder of Nature' Which Captivates the Imagination. It's Amazing." This was your typical roadside attraction. I thoroughly enjoyed it. 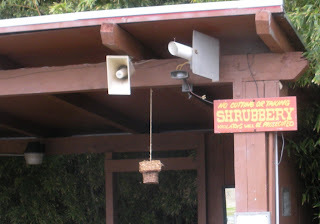 I particularly liked this sign: "No Cutting or Taking Shrubbery, Violaters with be Prosecuted". Stealing the bushes was not the first thing that came to my mind when I visited but apparently it's a problem. On the other hand, I was tempted to smuggle out one of the Tennessee fainting goats. The babies were simply adorable! We arrived just as one of the goats had given birth. The baby was so newborn it wasn't even able to fully stand yet. So cool! Of course, the main attraction was the geyser itself. Check out this video for Old Faithful (of California!) in all her glory. I learned something new -- a geyser is designated "Old Faithful" if it erupts at least every 45 minutes. There are 3 Old Faithful geysers in the US. From here, we continued our wine tasting tour at Summers Estate. The guys manning the tasting room at Envy recommended that we stop at Summers. They had some unique varietals and the host of the tasting room was a fantastic storyteller. He told us how Italian Charbono vines were very prevalent in the region in the mid-1800s but then fell out of favor in the present day. 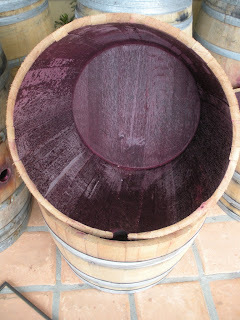 It's actually very rare now in Napa and Summers is noted for producing a wine entirely from Charbono. I really wanted to like the Charbono -- it had such a romantic and storied history but I really didn't care for it. 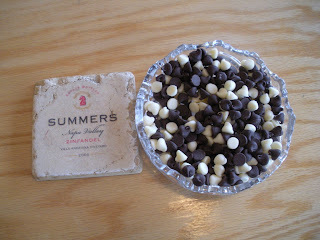 Summers gets my vote as a great place to stop though because they serve chocolates (and cherry tomatoes!) to go with their wines. I loved this bisected oak barrel outside of Summers Estate. 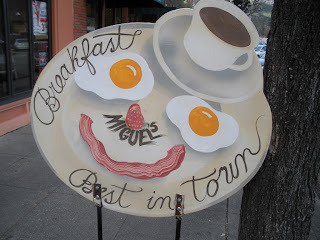 Next up, we made our way into the town of Calistoga for a quick lunch. These two smiley images really captured my mood for the day! We proceeded on to Vincent Arroyo Winery (also recommended by our new friends at Envy) which is known for their Petite Syrah. Vincent Arroyo does tastings by appointment only. We didn't know that when we arrived but they happily accommodated us. Not only did we get to taste three or four wines in the bottle but they also took us on a barrel tasting. 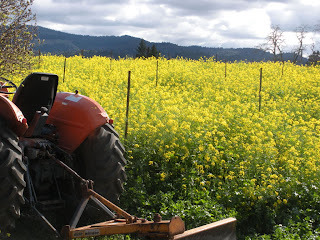 We saw this field of mustard on the Vincent Arroyo property. All of Napa Valley seemed to be lit up in yellow. It was a fantastic sight to see! 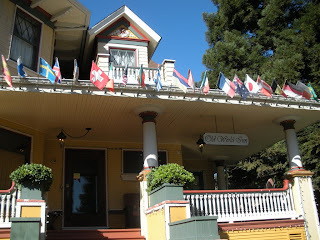 After a satisfying day of wine tasting, we made our way to The Old World Inn, our Bed and Breakfast for the weekend. We really liked the Old World Inn. There was plenty of opportunity to chat with other guests over breakfast or during the evening wine hour. The innkeepers mainly stayed in the background. The Old World Inn had fantastic modern amenities but old fashioned charm. They had a classic (working!) 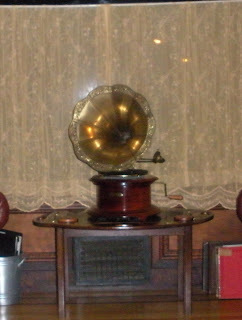 victrola in the living room. The alarm clocks in the all the rooms were set to play old timey music which really added to the atmosphere. Each room featured a projection screen TV. Our screen actually pulled down from the foot of our canopy bed. The surround sound speakers were actually mounted on the bed itself. 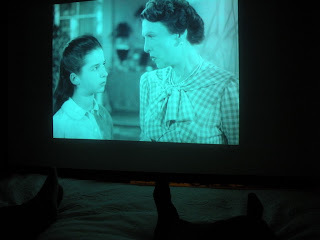 We watched The Philadelphia Story during our stay. The Old World Inn had an extensive collection of DVDs for guests to borrow. 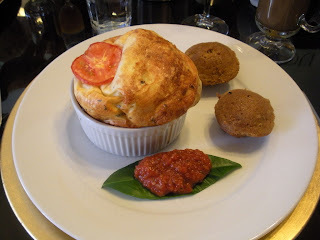 Breakfast on both mornings of our stay was exceptional. You can see the evidence below. 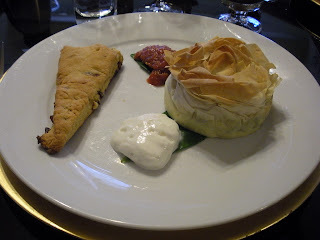 We had a delicious savory bread pudding on Day 1 (more like a souffle) and a spinach phyllo creation on Day 2. Yum! We started Day 2 of our weekend getaway at Hess Collection Winery atop a hill to the west of Napa. 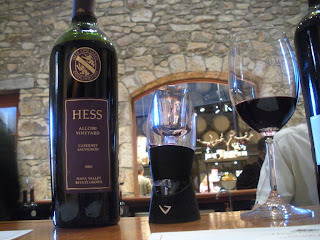 The wines were drinkable but the property itself was what made Hess exceptional. 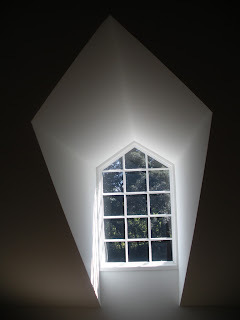 There were beautiful landscapes and vistas and a contemporary art collection inside. We stopped in St. Helena for lunch and then poked around in some of the shops along the the main road. 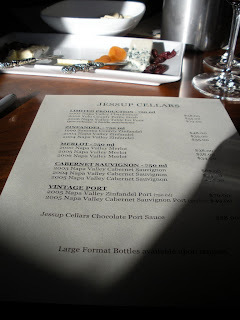 We then headed to Yountville to finish out our day of tasting at Jessup Cellars. Jessup had a coupon for 2 free tastings in the local visitor guide so we thought we'd give it a whirl. Jessup Cellars treated us like royalty. They set us up at a private table and brought us a plate of cheeses to sample. They also treated us to some dark chocolate with the final port tasting. I highly recommend Jessup if you're looking for great customer service and a relaxed, leisurely tasting experience. 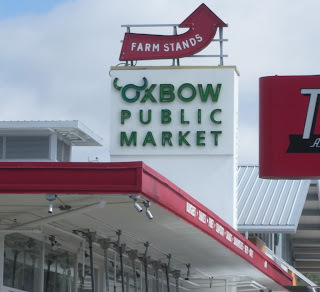 On our final day, we walked into Downtown Napa and visited the Oxbow Public Market. 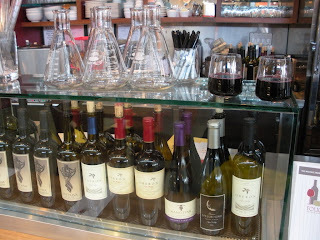 We sipped a glass of Petite Syrah from Folio Enoteca and Winery. They had a set-up where you could actually created your own batch of wine. It seemed to be an interesting idea but quite pricey ($50+ per bottle with a 2 case minimum). 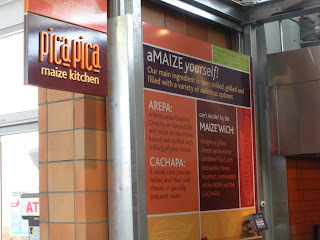 We paired our Petite Syrah with a creation from Pica Pica Maize Kitchen. 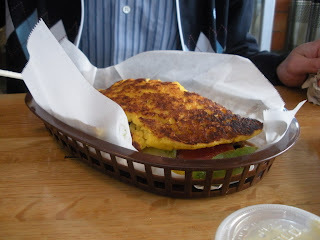 They served fantastic sandwiches served on corn bread. The result is a unique and tasty lunch treat. 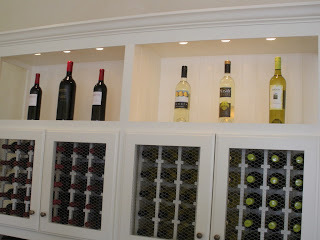 We tasted wine at two places -- Mason Cellars Tasting Room and Hagefen Cellars. Mason offers complimentary tastings. 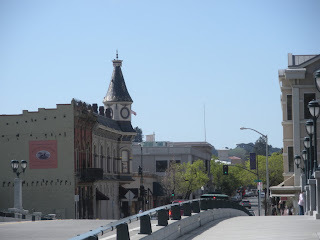 We walked back across the bridge from the Oxbow Market area into Downtown Napa. 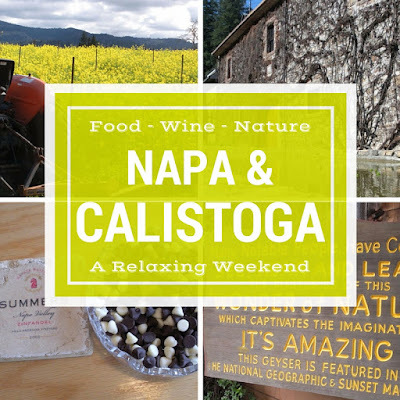 Photo highlights of a weekend roadtrip from San Francisco to Napa and Calistoga, California in March featuring food wine, and nature.